Reacts with keratinizing stratified epithelia and in differentiated areas of highly differentiated squamous cell carcinomas. Our Abpromise guarantee covers the use of ab9026 in the following tested applications. 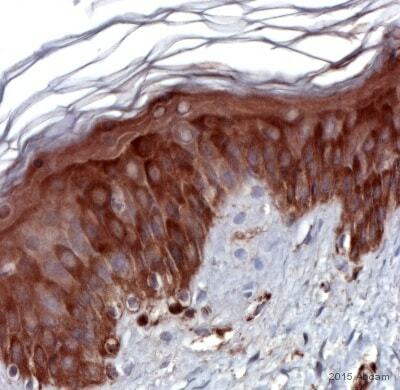 IHC image on a frozen section of dog skin showing its strong reactivity in the keratinizing epidermal cells. 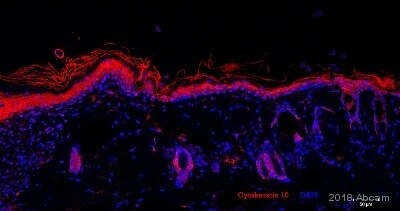 IHC image of ab9026 staining in Human cervix formalin fixed paraffin embedded tissue section, performed on a Leica BondTM system using the standard protocol F. The section was pre-treated using heat mediated antigen retrieval with sodium citrate buffer (pH6, epitope retrieval solution 1) for 20 mins. The section was then incubated with ab9026, 5µg/ml, for 15 mins at room temperature and detected using an HRP conjugated compact polymer system. DAB was used as the chromogen. The section was then counterstained with haematoxylin and mounted with DPX. Mesenchymal-epidermal interactions assessed by heterologous organotypic co-cultures (OTC). Heterologous OTC consisting of mice deficient for cathepsin L +/+ fibroblasts in collagen type I gels topped by normal human primary keratinocytes were grown air-exposed for 7 days. Paraffin sections were stained in haematoxylin and eosin (HE) or by immunohistochemistry for the proliferation marker Ki67 (Ki67, brown nuclear staining) and the differentiation markers cytokeratin 10 (K10, ab9026 1/100 dilution, brown staining) and transglutaminase (TG, brown staining). Bar 100 µm. Publishing research using ab9026? Please let us know so that we can cite the reference in this datasheet. I'm sorry to hear you are having problem with ab9026. Spotting can be frequently caused by the blocking agent you use, I would therefore try filtering it and leaving on the membrane for 30min, then rinsing the membrane with TBST. Incubate the primary antibody in TBST at 4C and rinse the membrane well, then incubate the secondary in TBST. You may also have to try different blocking agents (milk, BSA, serum). Spotting can also be caused by the secondary antibody and the detection kit, you may wish to try other secondaries and a new detection kit. Please let me know if this helps and do not hesitate to contact us if you still have problems and we will send you a replacement. The exact epitope of Ab9026 is not known. I'm afraid you just have to try and see if your truncated protein is still recognized by Ab9026.